David Robertson has signed a two-year contract with St Johnstone after rejecting a new deal with Scottish Premier League rivals Dundee United. The 24-year-old said: "I needed a change of scenery and I think St Johnstone can do well next season. "I have been at Dundee United for 10 years now, eight of which as a professional, so I'm looking forward to something new. "It is very hard to leave United, but I believe it is the right move for me." 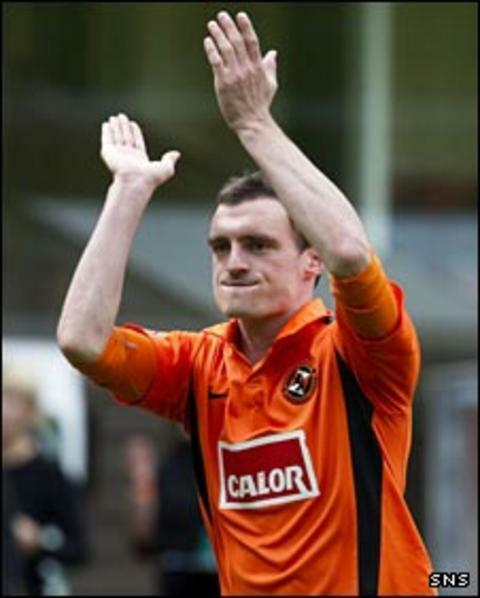 Robertson came through the ranks at Tannadice and went on to make 145 appearances after making his first-team debut in January 2006. "It will be strange going into a new dressing-room, but I'm sure I can cope with it and hopefully I can do well from the start of the season," he said. The Perth club expressed their delight at making the former Scotland Under-21 international, who won the Scottish Cup with United in 2010, their first summer signing. "David ends a nine-year association with Dundee United to join St Johnstone and Derek McInnes sees the 24-year-old as a player who can provide another midfield option and hopefully one which will provide a few goals," said a website statement. Manager McInnes is keen to add an attacking threat to a side that ended the season as the lowest scorers in Scotland's top flight with 23 goals in 38 games. Indeed, seven of the nine men released by Saints hours before Robertson officially signed on were forward players.